Medeski Martin & Wood were born out of New York City's downtown experimental music boom of the early 1990s, Jazzs premier funk-prov ensemble (DownBeat), made their Blue Note debut in 1998 with the best-selling Combustication, a finely-crafted, groove-heavy studio album that also spawned an EP of remixes (with contributions from Guru, Bill Laswell, and DJ Logic amongst others). MEDESKI SCOFIELD MARTIN & WOOD OUT LOUDER It's a match made not above nor below, but rather in some altogether hipper, unique place. We're talking John Medeski, Billy Martin, and Chris Wood, plus guitar guru John Scofield. On their new release OUT LOUDER, they make music not of this world, yet rooted in the earth tones of jazz, funk, and blues. Music from the heart, for the mind, and made to shake the earth, not to mention the body. 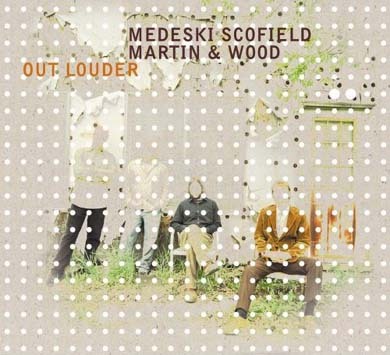 Medeski Scofield Martin & Wood first recorded together on Scofield's A Go Go (Verve 1998), a disc that has become a must-have classic. That project united jazz guitarist Scofield with the improvisational jazz trio Medeski Martin & Wood on material composed by Scofield and interpreted by all four musicians. OUT LOUDER the inaugural release for MMW's own Indirecto Records label is Medeski Scofield Martin & Wood's first four-way collaborative recording. "A Go Go was John's record and we were essentially sidemen, where OUT LOUDER musically comes from all of us" explains Wood. Scofield adds: "We've always hit it off as a foursome, and I wanted to see what would happen if we did something that was a true collaboration, where everyone could play completely free". Recorded in under a week at Shacklyn, MMW's fabled downtown Brooklyn studio, OUT LOUDER reeks of the scruffy, spirited basement in which it was created. "Something about being down there made the music that much grungier," says Wood. "It gave us that feeling of being a hungry garage band searching for the coolest licks and grooves without worrying about making everything perfect. We could just let it all hang out. Everyone was set up in the same room with all our amps and equipment, and you could feel what everyone else was playing that much better and really react to everything around you". "Maybe 60% was improvising and writing together," recalls Martin. "We have a typical MMW style which is going into the studio without knowing what we are going to do. We just play together and something will come out of it. We tried a lot of different ideas with John, but the best things seemed to come out of improvisation". "We played, hit the vibe, improvised and collaborated a lot," continues Medeski. "We'd go back and listen, and expand our ideas into a whole new tune". That, and the four musician's yen for jazz, funk, rock, soul and reggae, go a long way towards explaining why OUT LOUDER's deep grooves and sophisticated harmonies beg for closer inspection while simultaneously making you want to get up and dance. "People connect with grooves and funk, they feel it in their gut," says Medeski. "We understand complex harmonies, but in the end we know that you don't have to play all those notes to connect with people. The groove and spirit is what connects with people". OUT LOUDER's first track, "Little Walter Rides Again," opens with perhaps the funkiest drum roll ever committed to tape, disc or thin air (people may hate the disc," jokes Medeski, "but they'll still love that intro"), leading into a Scofield riff based on a line made popular by Chicago blues harmonica giant Little Walter. The tune is everything you could want from Medeski Scofield Martin & Wood an ultra-funky groove, sweet-and-salty guitar lines that stick in your head like peanut butter, dense organ grooves, and slippery bass licks. But that's just where the excitement begins. The following track, "Miles Behind," finds the quartet in full-on free jazz mode, paying tribute to Scofield's former employer Miles Davis' electric period. Wood feels that Scofield stepped out sonically on OUT LOUDER like never before. "It goes beyond the notes, it's the tones and the instruments he used," says Wood. In fact, for the first time in his career Scofield played a Fender Telecaster on a few tracks in addition to his trademark Ibanez AS200. Scofield lists the improvised track "Down The Tube" as a personal favorite. "It was the first thing we played after setting up, and it was completely spontaneous," he says. "At the same time it has a certain form, which came from listening to each other". Other tracks were developed through improvisation and subsequent development of those spontaneous ideas. "Sometimes we would play free stuff, listen back, make a song out of it, and then go back with that idea in mind and play free again," recalls Scofield. "I've never worked like that before. The music was all about surprise". Two of OUT LOUDER's most surprising moments, however, came in the form of songs that defy the project's overall free jazz aesthetic. "Tequila and Chocolate" is based upon a lengthy, structured line that mutates through a series of complex changes. In short, everything you would not expect from MMW, yet it works, thanks to a deep rhythmic groove and Scofield's harmonic navigations. There is also "Julia," a solemn take on a John Lennon classic featuring hymn-like guitar lines and Medeski's soulful keys. "It's one of those things that could walk the line between beautiful music and elevator music, and we took it in the right direction," insists Medeski. "I played a church-like organ line that gives it a sort of sacred sound". OUT LOUDER ends with an improvisation-rich take on Peter Tosh's reggae anthem "Legalize It." "What makes this exceptional is the combination of the groove and John's guitar sound," says Martin. "It is on the edge of being corny, sweet, and weird at the same time. The tune is there, but with a really edgy phrasing that could only come from these four musicians". And that is what makes OUT LOUDER so special it could only have come from John Medeski, John Scofield, Billy Martin & Chris Wood. And there is more to come. For the first time ever, Medeski Scofield Martin & Wood will embark on a tour (see dates below), showcasing their collaborative, instinctive sound. Look for them to perform music from OUT LOUDER and A Go Go, with several yet-to-be-released tunes poised to be thrown into the mix. Yes, this music does come from a deep place, and Medeski Scofield Martin & Wood are ready to take it out there and everywhere.